There’s a reason why the pros use face masks – they work! So, whatever issue you might be facing (dehydration, pesky blemishes, lack of radiance), select one that’s right for your skin. Apply as directed. And hey! While you’re waiting the usual 10-15 minutes, why not turn on some relaxing music and light some candles? Mood is everything. Most professional spa visits include a hot towel treatment to open pores and thoroughly rid your skin of impurities. Lucky for you, towels are easy to come by at home! After you’ve applied your mask, soak a soft cotton towel in water, wring it out until slightly damp, and use it to clean and wipe off the excess product. 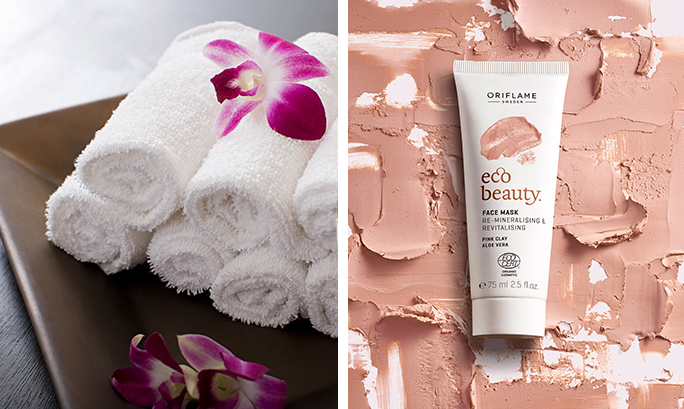 Voila – fresh skin for days! The key to a great at-home manicure and pedicure is being prepared with the right products. Make sure to have the following on hand: nail polish remover (perfect for prepping), a pumice stone (for banishing pesky callouses), a buffer (for smoothing surfaces), cuticle cream (for adding nourishment) and of course, the perfect shade of polish to dazzle.